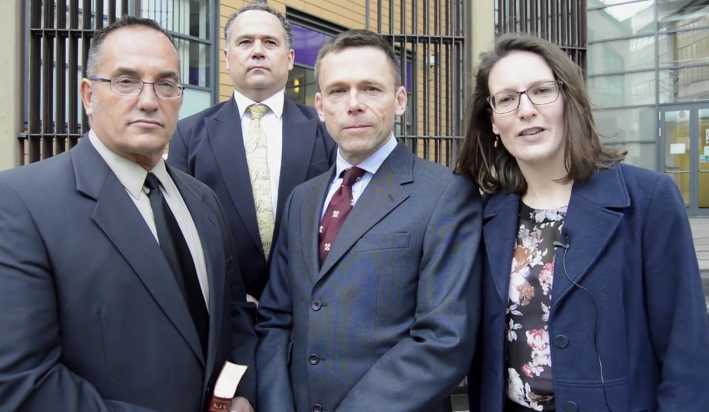 BRISTOL, UK — Two street preachers who were arrested last July on accusations of “causing a disturbance” and engaging in “anti-social behavior” after some listeners became offended by their speech about issues such as Islam, Buddhism, homosexuality and divorce have been found guilty of “intentionally alarming” the public with open-air preaching. During their trial, prosecutor Ian Jackson “told the court some of the statements made by the preachers may have been in the King James Bible, translated in 1611, but that did not mean they were acceptable in 2016,” according to the Daily Mail. As previously reported, Overd and Stockwell, along with Adrian Clark and Don Karns, had been taking turns open air preaching outside of the Bristol shopping center on July 6, as well as engaging passersby in conversation and/or holding gospel signs. Two of those involved in the evangelism effort, Stockwell and Karns, were American citizens visiting the country to share the gospel. The men allegedly preached on a variety of issues, and took questions from those who stopped to listen—questions that ranged from Islam, Buddhism, Jehovah’s Witnesses, homosexuality and other moral and religious issues. An online video shows the moment the men were arrested. Seconds later, Overd was approached by a police officer, who ordered him to leave the area. “Go home! Go home!” a few men nearby chanted. The officer warned that if Overd did not stop preaching, he would be arrested. “For God so loved the world, guys, that He gave His only begotten…” Overd declared, advising that he was not going to leave. The officer consequently grabbed Overd by the arm while he was speaking and pulled him away. The crowd clapped and cheered enthusiastically. “People were getting angry. You were challenging [homosexuality]. You were challenging Muslims,” the officer replied. “But just saying what the Bible says,” Overd noted. “That’s fine,” the officer said. “Well, if it’s fine, why are you arresting me?” Overd asked. Stockwell, Karns and Clark were also arrested, but the charge against Karns was later dropped and the charge against Clark was dismissed last week at trial. U.K. blogger Richard Carvath decried the guilty verdict handed down against Stockwell and Overd on Tuesday. “[T]he four Christian men were preaching—quite lawfully—about their Christian beliefs in a public place in Bristol; they were certainly not bent on causing any trouble. They were not violent and did not incite violence. They spoke no profane words,” he said. The men plan to appeal the verdict.